Samsung announced the Galaxy S6 at Mobile World Congress in Barcelona on March 1, 2015, as a fresh successor to 2014's Galaxy S5. Aside from the general shape and size, there's not much in common between the two consecutive models. Alongside the S6 came the S6 edge, a variant of the S6 with identical specs, but with a curved screen that wraps around the sides of the device. The Galaxy S6 has the same sized 5.1-inch screen and button placements, but is made of a solid metal frame with Gorilla Glass 4 on both sides giving it a completely different look and feel. This differs greatly from the previous year's Galaxy S5 which was constructed mostly of plastic. The display is now QHD (2560x1440), and the internals have been bumped up to support it — with an Exynos octa-core processor, 3GB of RAM and 32/64/128GB of storage. With the Galaxy S6, Samsung is for the first time in years making smartphone hardware that is on par with — or better than — what the rest of the industry is putting out. With a finely-crafted metal and glass body, the GS6 certainly looks worthy of the price tag Samsung has put on it, and that's before you get to the high-end internals and industry-leading display. With the design change Samsung also decided to drop the seemingly-popular SDcard slot and removable battery (which is a smaller 2550mAh unit), and instead thinned out the phone to just 6.8mm thick and included both Qi and Powermat wireless charging capabilities. The camera in the Galaxy S6 is also an extreme improvement from years past, and arguably one of the best smartphone cameras to date for Samsung. The S6 also supports both major wireless charging standards. A fingerprint scanner built into the home button offers added security for users, and is much improved from the S5. Where the S5 required your to slide your finger to scan, a simple tap does the job on the S6 — and does it extremely well. The Galaxy S6 also features Android Pay and Samsung Pay, (Samsung's alternative to Android Pay). Both services allow uses to pay with their phone at NFC-enabled terminals, however Samsung Pay also lets users of Samsung devices pay at nearly any credit card terminal -- even if the terminal does not support enabled. It does this using built-in hardware that is able to talk to older terminals using Magnetic Secure Transmission — or MST — in addition to standard NFC transmission. The camera on the Galaxy S6 is one of its brightest new features, carrying over the same image sensor and optical image stabilization from the Galaxy Note 4. The camera on the S6 features a f/1.9 aperture, HDR, and object tracking autofocus. New features combined with better low-light performance make the camera on the Galaxy S6 one of the best we've seen on an Android phone thus far. One aspect of the Galaxy S6 that left a bit to be desired was the non-removable 2550MAh battery. Unlike the S5 — which had great battery life for most and featured a swappable battery — the S6 battery life was not on par for most, leaving many complaints about the need to charge frequently since the phone did not make it through the day on a single charge. 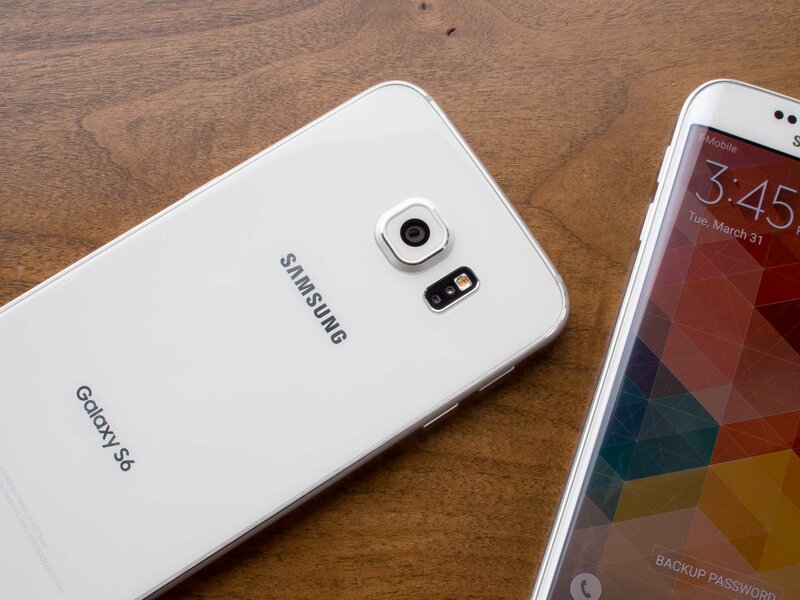 Rumors of the Samsung Galaxy S6 first surfaced sometime around January 2015. It was first reported that Samsung would be ditching the Qualcomm Snapdragon 810 processor in favor of the Exynos system-on-chip (SOC) for the Galaxy S6. It was later reported that the S6 would have an all-metal body, breaking away from the mostly plastic versions of the device in previous years. It was also noted that two variants of the S6 would be made available -- standard design as well as a model with a curved screen. On February 22, 2015, the S6 was officially teased by T-Mobile, showing off a curved device with the line "Six Appeal". The Galaxy S6 launched globally at the beginning of April 2015 in four different colors — white, black, gold and blue — with support from the major U.S. carriers and retailers, as you'd expect. At three years old, your Galaxy S6 is probably feeling the weight of time. So, is the Galaxy S9 the right phone to upgrade to? Here's what you need to know to make the jump. The Galaxy S6 series was first introduced over three years ago, and Samsung's finally deciding to the pull the plug on software updates for the phones. Samsung partners with uBreakiFix for same-day Galaxy S9 repairs across U.S.
Samsung customers can now visit any of uBreakiFix's 300 U.S. stores for same-day repairs, including warranty service when applicable but also out-of-warranty fixes on older phones. Welcome to Android Central! What app are you using to share the photo -- the stock Gallery app, or Google Photos, or something else? Seemingly out of nowhere, T-Mobile support pages confirm that Android 8.0 Oreo is in the works for the Galaxy S6, Galaxy S6 edge, Galaxy S6 edge+, and Note 5. We've seen plenty of devices updated with patches for KRACK, and the latest include the Galaxy S6, S6 Edge, S6 Edge+, and Note 5 on Verizon. AT&T has finally started rolling out the Nougat update to the Galaxy S6 series. The Galaxy S6, S6 edge, and the S6 active are now receiving the OTA update, which includes the April 1, 2017 security patch. Update, April 24: It looks like T-Mobile has rolled out Android 7.0 Nougat to its Galaxy Note 5 units, too! Go get it! How can I get custom ringtones back? Clearing the cache has proved to not be a solution to this problem. Cases that integrate external batteries can potentially fix your Galaxy S6's battery woes, and while they aren't a new idea they may be on your radar for the first time since picking up a GS6. Nougat for 2015-era phones, thanks to Samsung and Sprint. Two years on, the Galaxy S6 holds up well but doesn't provide the top-tier experience the latest phones do — the Galaxy S8 would be a great upgrade to make. Welcome to Android Central! Are you saying the Answer button doesn't even respond to touch? Samsung has kicked off the Nougat update for the Galaxy S6 and S6 edge, with customers in Germany, Switzerland, Italy, and the UK receiving the OTA update. The top battery packs for your aging Galaxy S6! Still loving your Samsung Galaxy S6? That’s fantastic. But what might not be so fantastic is your phone’s battery life. That's where having a battery pack for your Galaxy S6 comes in handy. Following the Nougat rollout for the Galaxy S7 and S7 edge, Samsung has revealed the list of phones that will receive the update next. Moved to S6 for comments from users.